Recently, I have begun reevaluating everything I thought I knew about animals. I've been approaching long ignored questions about their life, value and fate with as much freshness and humility as I can muster. As I lean in, I find it shocking what I have been able to overlook. As I newly gaze upon some of the most basic elements that compose a full picture of non human life, I am all at once inspired, amazed, and convicted. I have begun reading a book by a man who is both an ardent man of faith and a thoroughly convicted animal activist. His writings illuminate the issue with great purpose and urgency for me. Standing up for animals does not mean that animal suffering is comparable to the oppression and suffering of humans beings. Rather, it is an acknowledgment that animals matter as well-- and that no injustice is beneath our attention or care, because all injustice matters. Scully's book is called Dominion: the Power of Man, the Suffering of Animals, and the Call to Mercy. The title is wonderful, because it reclaims a word that has been used to excuse the blatant abuse of the environment for our own purposes. In the Genesis creation story, God gives man "dominion" over the earth, charging us with the "care and keeping" of the garden and it's animals. Do we really believe that this means animals have have no worth or value apart from what we can assign to them? That it is a free ticket to use up the world's resources, hunt species to extinction, and terrorize the animal kingdom, so long as it serves some immediate purpose for us? How laughable, and how selfish this assumption is. Yet that is exactly how many behave, as if God handed us the earth and said, "Here, destroy this. It's fine with me." There is no doubt that we humans are unique and powerful among the animal kingdom. There is something special and unique about us. Something extraordinary, powerful, dangerous. Genesis also gives us a charge, to protect and preserve the rest of God's creation. We have the power to do build up, and we have the power to tear down: all animals on earth are at our mercy, and their fate rests in our hands. Unfortunately, we have used this massive power to destroy the earth and its inhabitants far more than we have used to to protect. The Hebrew word dominion is used in another area of scripture: in describing a parent's role towards their child. The responsibility is to cultivate growth, to protect, and to cherish what has been left in our keeping. Nature and animals are not garbage that we are allowed to throw away. On the contrary, the earth is filled with mystery and wonder and awe, full of creatures that breathe and thrive and feel, all apart from our involvement. The scripture says that all creation sings to God, and that he is delighted in what he has made. There is a sense of awe we must come to, a feeling of deep respect; a recognition that all that is in this world does not belong to us, and we had better treat it with care, because we are watching over someone else's stuff. I love this quote. Because all in nature is not nothing, and all is not permitted. I think of my Papaw. He was not an animal trainer or farmer or scientist, but he was one of the kindest, most gentle souls I have ever known. His tenderness extended even to animals. It was as if they recognized the basic goodness in him ,and trusted him him for it; animals gravitated towards him in a way that always seemed magical to me. Dogs loved him. Birds didn't seem to flee from him. In his presence, everything felt like Eden. I close my eyes and I am back there with him, in the field of clover at springtime. On one side of the pasture is a little white church where he had delivered that Sunday morning's sermon, dressed in velvety black robe, on the other, the humble brick one story house he and Mammaw lived in. The Indiana field is wide and green, speckled with yellow dandelions, and there are cows grazing beyond a wooden fence. Papaw holds me by the hand and we walk from the chapel to the house, unhurried. There is a bee buzzing around us. I whimper, ducking behind him to hide. I remember Papaw bending down and extending his hand to the little bee. In it's own time, the bee hovers closer and lands on his hand, exploring it. It was Papaw's way of silencing my fear, showing me that in fact, my apprehension was an opportunity to marvel at something good God had made, and connect with another being through gentleness. This is a photo of me in Papaw's lap. The raccoon sniffing my hair is a fellow that often visited my grandparent's backyard, and had become friends with my grandfather. It would wander over from the woods, and though my Mammaw had grown irritated by it eating the vegetables from her garden, Papaw had formed a special bond with the animal. It would climb up onto his shoulders without needing persuasion; Papaw was always related to animals on their own terms. I remember it beings a lot like a cat, but more magical and wild. And it was Papaw who he's decided to trust. My grandfather had regard for even the least "significant" people. He left me a legacy of tenderness; a picture of a life marked by compassion. Even for the lowly. Even the animals. I don't need to be convinced that animals are intuitive, capable of sadness and joy, or intelligent. I know this is true, because I live with an animal-- in fact, I probably spend more time with him than any other living being besides my husband. Henry is my one year old German Shorthaired Pointer. He I have a special bond. It's something that's difficult to describe, but that every person who has ever let an animal into their home and heart will understand. Even as I write this, Henry is curled at my side, his face resting on my leg, breathing slowly. He trusts me implicitly, and we are comforted by each other's presence. He wakes us up in the morning by jumping into our bed and licking our sleeping faces, his tail wagging as he stretches over the quilts. He loves to swim, explore the woods, and make friends at our local dog park. He brings joy to everyone he meets. When I'm sad, Henry knows it, and he comforts me. One bad day I retreated to the bedroom and cried. Henry quit all of his horseplay and immediately laid down by my side. He remained with me, looking up at me periodically and licking my hand with tender concern. I know that if I were in danger, this dog would protect me with his life. He's not just a dumb animal that lives in our house, but a being that has a personality, preferences, fears, thoughts, and genuine affection for us. You might say that pet owners are sentimental and biased when it comes to their pets, and that may be true. Is Henry really like any other animal? no affection whatsoever is horrific and appalling. The idea of him being hung up by his foot and gutted while still alive is beyond imagining. I would think it to be not only tragic, but basically wrong. Yet, that is the exact fate of countless animals "factory farmed" for consumption. Why the drastic disconnect? Why is it that we love some animals, and value their lives, and have complete disregard for the lives of others? There is no denying that there are enormous inconsistencies in how we as a society interact with animals. 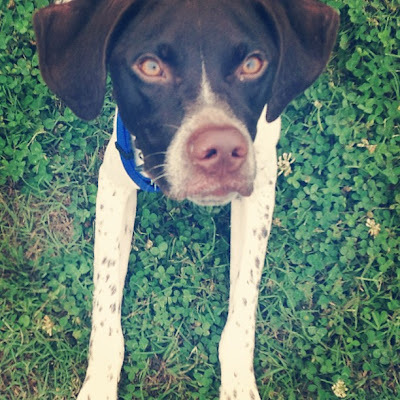 In the US, abusing or neglecting the needs of a dog or cat is punishable by law. 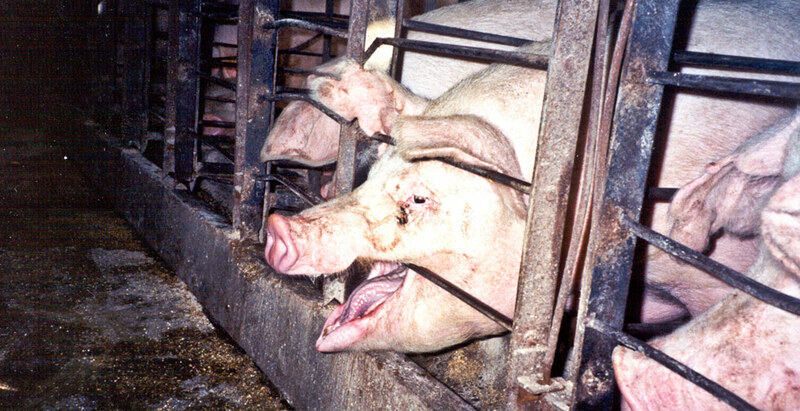 Meanwhile, pigs, cows, and other animals endure almost unimaginable torment in modern factory farms. We tear up watching a Sarah McLaughlin commercial about abandoned pets as we chew on a hamburger, and don't even make a connection between the two things. Now, it is important to consider animals individually, because they are vastly different from one another, and therefore have vastly different needs. It's not always good to lump them all together in one big category. For example, I am not opposed to keeping a pet fish, but I am opposed to keeping a Killer Whale in captivity. The whale's limbic system (the part of the brain which processes in emotion) is in many ways more complex and developed than that of a human, and he is a culturally and socially dynamic animal. Therefore captivity is far more physically and emotionally devastating for him than it is for the goldfish. There are certainly hierarchies of intelligence within the animal kingdom. But intelligence does not always negate pain, suffering, or sadness. Certainly intelligences must sometimes be considered different rather than better or worse. Animals have different sensory abilities- we, for example, cannot see with sonar, nor can we see some of the colors other animals can. We are different. We have to regard them as individually unique, but no matter what, we have to regard them. We have not been kind to the animals. We have seen it fit to use them in any and every way we desire, even if it means their lives are pathetically reduced torment, their natural way of life disrupted, and their species goes extinct from the planet. Animal cruelty, however, is a different conversation entirely. Considering the way in which meat is "produced" today, I am not entirely convinced that I can participate in first without participating in the second. We all have some vague conception that "maybe things aren't that comfortable for the animals that we eat, but it probably isn't that bad, and I don't need some pushy vegan making me look at gruesome photos that might spoil my appetite." Our ignorance on this subject is not due to a lack of available information, but rather, on a desire to avoid something that may weigh heavily on our conscience. As thinking person of conviction, I have felt the need to look at this issue with fresh eyes and more serious consideration. The truth is that things are very bad. The way we "produce" meat is not even close to natural, let alone humane. The meat industry driven is by finance, convince, and mass production. Those who know anything about factory farms know that they are far more factories than they are farms- producing more meat than we need, more waste than we can handle, and subjecting millions of animals to lives of perpetual torment, dread, and horror. Your hamburger was not produced from a cow that happily grazed in a sunny field, growing old, healthy and fat, but more likely, a cramped and miserable creature that never received a shred of kindness in it's life, and died a slow and agonizing death, because of cost effectiveness. Animals are pumped full of hormones to make them bigger faster, and all things they ingest, we ingest. 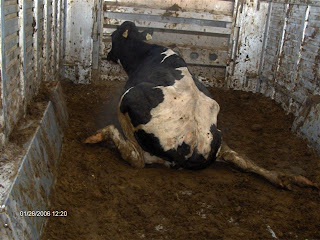 Since watching extensive footage of factory farmed animals being kicked, stunned, electrocuted, abused, shouted profanities at, chained, exhausted, diseased, and brutally slaughtered, I have not eaten meat. I have not been able to, not just because it made me queasy, but because I didn't want to participate in that mess of unnatural and cruel behavior. For now, that is my personal conviction and response to what I have been exposed to. No matter what you personally decide to eat, I think it's important to be informed and to decide with integrity, exploring all options. There are currently more elephants in captivity than there are in the wild. 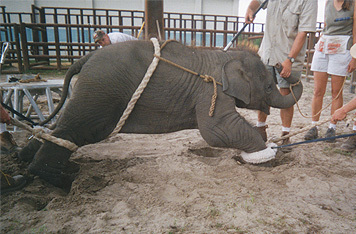 As some of the most intelligent creatures on the planet, they do not fare well emotionally or physically in a captive environment, least of all in circuses, where they are badly abused for the sake of entertainment. They are poached and killed on astronomical levels so that their ivory tusks can be made into trinkets and jewelry. 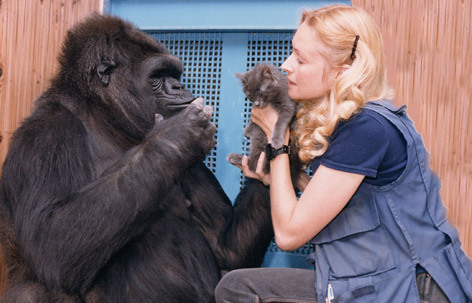 Speaking of intelligent animals, have you heard of KoKo the gorilla? This 43 year old creature loves Mister Rogers Neighborhood, Kittens, opening birthday presents, and painting. She has specific memories of her past, specific preferences and wishes, and a large range of emotions. She is able to communicate all of these things with relative proficiency in a human language: ASL. (If you want a good cry, watch the video of KoKo reacting to the news that her kitten was hit by a car. She repeatedly signs "bad, sad, cry, tears," and makes sounds similar to human weeping.) She desperately wants to be a mother, and has expressed a desire to adopt. (seeing images or footage of baby gorillas or even baby humans, she signs, "bring to me, KoKo is good, Bring baby here." She is gentle, kind, empathetic, and intelligent. Her species is going extinct because human beings poach their kind and impede on their habitat. You can visit these incredibly sentient and emotional creatures behind bars at your local zoo. Even the animals we love most suffer at our hand. It is estimated by the Humane Society that six to eight MILLION dogs and cats brought to animal shelters each year, either from the streets or from pet owners who abandon them. Of those, three to four million are euthanized a year. Dog abuse runs rampant in our country- from the abhorrent conditions of puppy mills, to fighting Pit Bulls to death, to racing Greyhounds until they are used up and disposed of, dogs are as much an object to us as any other product we buy. Domestic abuse against woman almost always accompanies the abuse of that household animal, if a pet is present in the home. This fact is not surprising, but telling: people who abuse animals have been psychologically proven to be more likely to abuse other people as well. 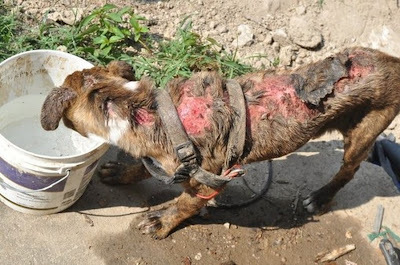 Over 100 Million animals are burned, crippled, poisoned and abused in US labs every year. Yet, 92 percent of drugs that are tested safe on animals are unsuccessful in human trails. Tests for cosmetics and household cleaners sometimes require animals to receive "lethal doses" in order to determine how much of any chemical or product is fatal. 100 million animals. An not just rats or guinea pigs, either... highly evolved creatures like monkeys are injected with deadly chemicals, dissected alive, badly injured to simulate car crashes or sports related head injuries, and live in constant fear. The list of injustices goes on, as I'm sure you might imagine. I cannot presume to know the answers, or suggest a way to amend all these wrongs. I am still learning myself, and still figuring out what all of this means for me personally. It is my hope that our discomfort with animal cruelty becomes moral conviction, and that conviction inspires change. It's not too late to choose mercy, or to see an animal in a new way. How exciting it is when we do!